The American alligator is a relatively large species of crocodilian. On average it is the second largest species in the Alligatoridaefamily, behind only the black caiman. 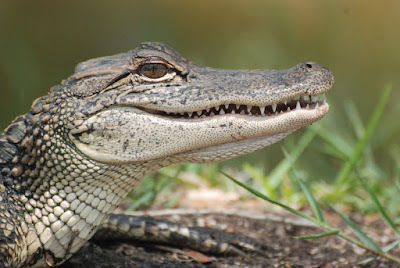 As with all crocodilians, and as opposed to many mammals where size eventually diminishes with old age, healthy American alligators may continue to expand throughout their lives and the oldest specimens are the largest. Very old, large male American alligators reach an expected maximum size of up to 4.6 m (15 ft) in length, weighing up to 453 kg (1,000 lb), while females reach a maximum of 3 m (9.8 ft). On rare occasions, a large, old male may grow to an even greater length. The American alligator is considered an apex predator throughout its range. 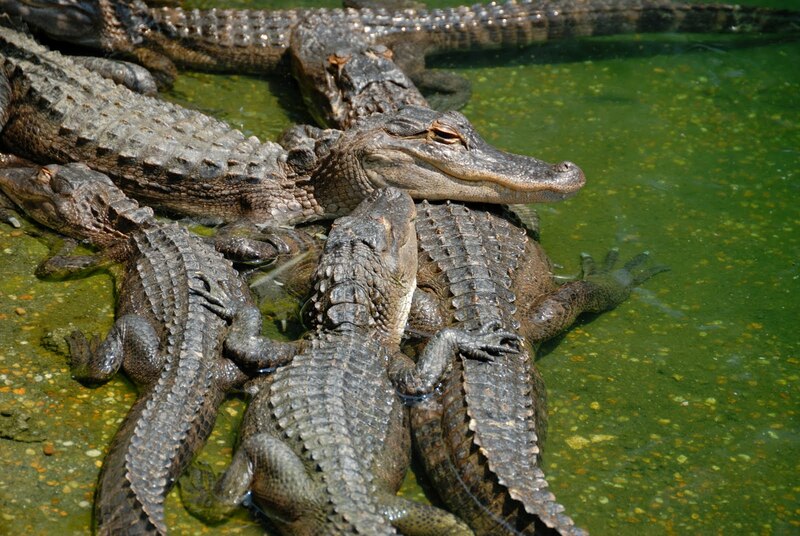 They are opportunists and their diet is determined largely by both the size and age of the American alligator and the size and availability of prey. Most American alligators will eat a wide variety of animals, including invertebrates, fish, birds, turtles, snakes, amphibians, and mammals. Hatchlings mostly feed on invertebrates such as insects, insect larvae, snails, spiders, and worms. 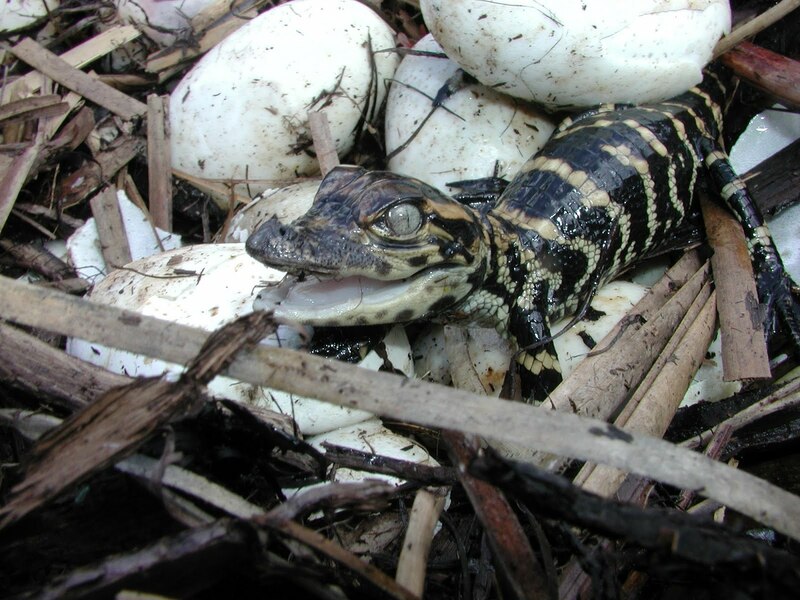 As they grow, American alligators gradually expand to larger prey. Once an American alligator reaches adulthood, any animal living in the water or coming to the water to drink is potential prey, due to the size and power of the American alligator. 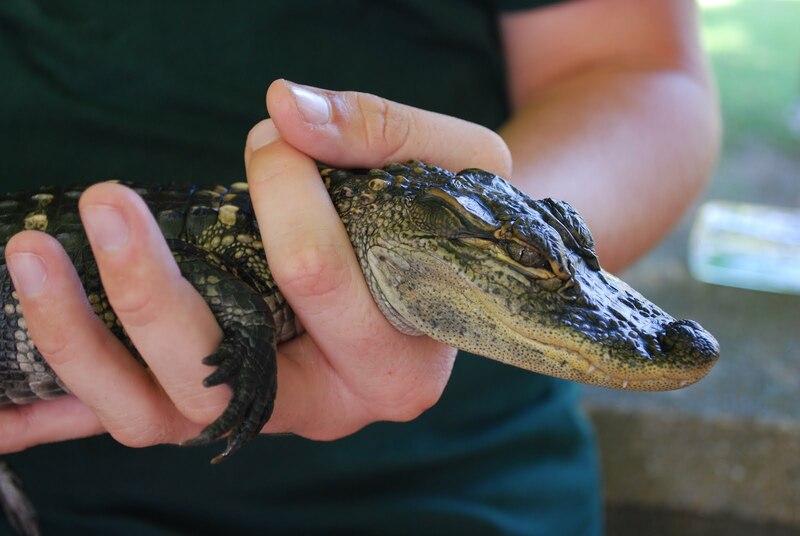 However, most animals captured by American alligators are considerably smaller than the American alligator itself. Stomach contents show, among native mammals, muskrats and raccoons are some of the most commonly eaten species. In Louisiana, where introduced coypu are common, they are perhaps the most regular prey for adult American alligators, although only larger adult American alligators commonly eat this species. Other animals may occasionally be eaten, even large deer or feral wild boars, but these are not normally part of the diet. Occasionally, domestic animals, including dogs, cats, and calves, are taken as available, but are secondary to wild and feral prey. Other prey, including snakes, lizards, and various invertebrates, are eaten occasionally by adults.Water birds, such as herons and egrets, storks, waterfowl and large dabbling rails such as gallinules or coots, are taken when possible. Occasionally, unwary adult birds are grabbed and eaten by American alligators, but most predation on bird species occur with unsteady fledgling birds in late summer as the prey of American alligators, as fledgling birds attempt to make their first flights near the water's edge.